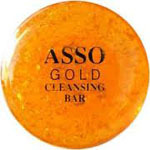 The Asso Bar is described as a luxurious facial soap bar. Of course it comes in that type of package, as a bar of soap. It is not a lotion or anything like that. The bar contains real gold flakes. It is supposed to help in treating damaged skin, but the bar of soap itself actually just makes things worse. Contains real 24 Karat gold flakes, and helps rejuvenate skin through gold’s anti-oxidants. I feel like the reason this is so popular is because of the fact that it contains real gold. However, the gold itself comes in small flakes that have hurt my skin when I used it on the really sensitive areas. This was recommended to me for helping with my eczema and though I did notice that after sing it my pores looked tighter and cleaner, in the end I felt like it hurt more than it helped and it wasn’t worth going through the pain. Gold may have anti-oxidants, but so do other things. The only reason they include actual gold in it is to make it more expensive and to make people more attracted to it. Practically, this bar of soap has little benefits over an average bar of soap bought at a nice store. In the future I will save my money instead of going for products like this.